Let's talk about ASOS Curve. We know there are things they don't do very well - using models who actually wear the sizes the range is stocked in, for one. Also, sticking to a reliable sizing system (will you need an 18, 20 or 22? Who knows). Shopping from the range does require a little luck - but they offer free delivery and returns to UK customers so you don't lose out if you have to send stuff back or order multiple sizes to be on the safe side. And there is one thing they do very, very well indeed, and for this perhaps we can forgive them the size 14 models (for now). The range brings plus size shoppers a big range of affordable trend-led clothes that aren't diluted to the point where they're unrecognisable. Floral maxi tea dress? Done. Leather panel leggings? Of course! You won't find any hanky hems or waterfalls cardis here. Every time I feature pretty dresses in this column I'm greeted with cries of "BUT WHERE ARE THE SLEEVES?" Well, ladies, I have found The Sleeves, hanging out on this wrap-front dress in sheer chiffon-like fabric. The black version is in the Summer sale for £28, but it also comes in a slightly more summery royal blue if you prefer. Classic black skinny jeans. Under twenty quid. Done! Some people may ask "But can bigger girls really wear skinny jeans?" My answer to that? Well, you have legs, don't you? And here's the shirt (£24.50) to go with your new skinny jeans (see above). Western-inspired detail is all over the place at the moment, and the little details on this shirt (the blouson cuffs, the concealed buttons) make it a bit more special than rival offerings. 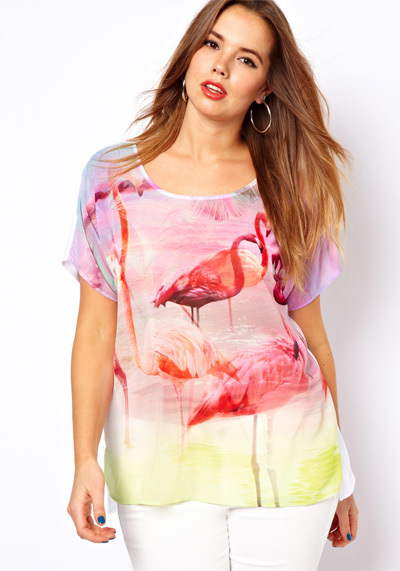 For those who hated the lobster dress from last time, perhaps I can tempt you with a flamingo t-shirt? I may be fighting a losing battle here, but it's only £17 and would make you smile on rainy summer days when the weather refuses to cooperate. The 30% off promotion runs for a limited time only so grab your bargains while you can. May I also suggest chucking these amazing sunglasses in your basket before checking out? That black, sleeved dress is honestly one of the most beautiful things I've ever seen.